This homemade Wheat Halwa (Tirunelveli Halwa) is one of the most popular halwa varieties in South India, especially in Tamilnadu. This traditional halwa is made using flour, sugar and ghee. Often made during special occasions and festivals, the halwa makes a delicious dessert for any meal. 1. Add the wheat flour to a pan. 2. Gradually add enough water and mix well without lumps. 3. The batter should have a thin consistency and should not be thick. 4. Heat little ghee in a heavy-bottomed pan over low flame. 5. Fry the cashew nuts and keep aside. 6. Add some more ghee and the prepared batter. 7. Keep stirring all the time, while gradually adding more ghee, until thick. 8. After 30 to 40 minutes when the mixture has thickened, add sugar, cashew nuts and kesari powder. 9. Keep stirring, add some more ghee if required. 10. When the ghee starts to separate and the mixture does not stick to the ladle/pan bottom, switch off the flame. 11. Transfer the halwa to a greased plate. 12. Allow it to cool and cut into slices. 13. Serve or store it in an airtight container. Tip: If the batter is too thick, then the raw smell of the flour can linger in the mouth for quite a while. Note: The recipe picture has been shot using an Asus Zenfone 5. This phone is one of the best mid-range phones in the market with a wide assortment of features and with a sleek, compact design. The multimedia performance is better than most of the other phones in this segment. Overall, if you are cash strapped but want a top notch smartphone, then look no further. 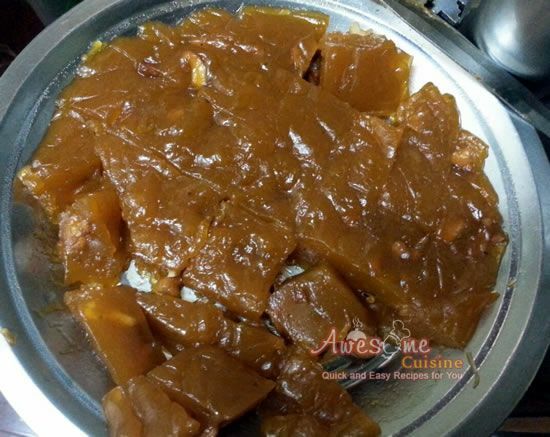 Feel free to comment or share your thoughts on this Homemade Wheat Halwa Recipe from Awesome Cuisine.